AAATalks / Car Care / What’s an Alternator? Your car relies on a device known as an alternator to charge the battery and power the car's electrical system when the engine is running. In years past, automobiles used generators to charge the battery and power the electrical system. With advanded technology, alternators are now the standard and provide enough current to power lights, wipers, heated seats/windows, and all the other electrical goodies we find in modern cars. As part of your car's electrical system, the battery provides the juice to turn the starter, and then the alternator takes over once the engine is running. The current produced by the alternator is used to keep the battery charged and powers all the electrical systems such as the radio, lights, and computer behind your engine. 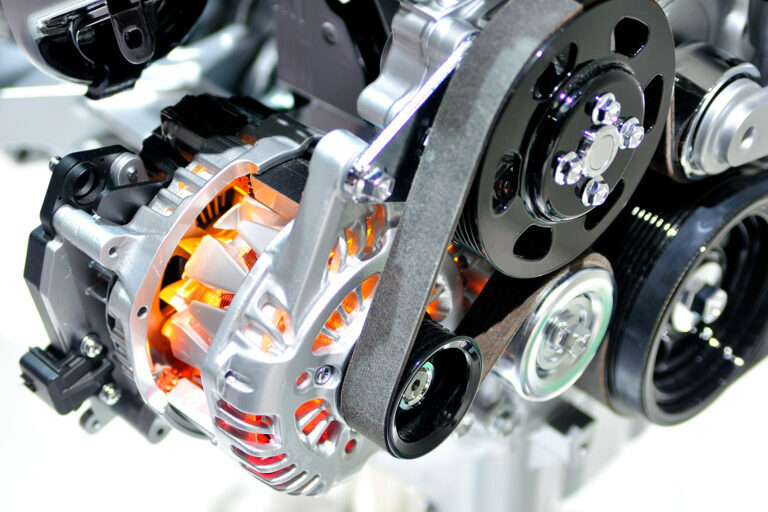 Inside the alternator is a rotor that spins at high speeds and creates an electromagnetic field, which is then converted to direct electric current. When you have a discharged battery, an indicator light appears on the dashboard. You'll know the battery is probably dead when you turn the key and the car won't start. If you hear clicking, it could mean the battery is going bad, and you probably need to replace it. You should also visually inspect your battery for corrosion or damaged wires. Since the alternator has an important job, you need to recognize the signs when it is starting to wear out, too. Things to look for include fading or flickering interior and exterior lights, warning lights on the dash, and a battery that won't charge when the car is idling. You may also have trouble starting your car or experience stalling. If your alternator is not generating the proper voltage, your vehicle will use current supplied by the battery alone until the battery is depleted. At that point you will be stranded. Many calls for roadside assistance have to do with the battery or alternator. As an AAA member, you will never be left stranded. Our Mobile Battery Service can come to you and test your battery and system. If your car doesn't start, we can provide a jump or sell you a new battery and install it for you. If your vehicle can not be safely operated after one of our roadside services, we will tow it to the nearest AAA Car Care Center for further inspection. You can have peace of mind with a AAA Premium Battery, knowing your vehicle will start every time. AAA Premium Batteries are guaranteed fresh and affordable with an unmatched warranty. Every battery we sell is less than 150 days old and comes with a 6-Year Club Assist Battery Warranty. When you have your battery inspected at your next visit to AAA Car Care, we will check your alternator, too. If your alternator or battery needs to be replaced, we can easily do that for you. Preventative care is the best way to protect your investment. Schedule routine maintenance with AAA and avoid roadside emergencies.